Kepler-22b is an extrasolar planet orbiting (going around) G-type star Kepler-22. It is located about 600 light years away from Earth in the constellation Cygnus. It was found by NASA's Kepler Space Telescope. It is also the first known planet to orbit within the habitable zone of a Sun-like star. Kepler-22b's first transit in front of its host sun was observed on Kepler's third day of scientific operations in mid-2009. Kepler-22b's third transit was detected in late 2010. The Spitzer Space Telescope provided more data that confirmed Kepler-22b's transits. On December 5, 2011, the confirmation of the existence of Kepler-22b was announced. A diagram of the Kepler-22b System, compared to our Inner Solar System. Kepler-22b's radius is roughly 2.4 times the radius of Earth. Its mass and surface composition remain unknown, with only some very rough estimates established: It has less than 124 Earth masses at the 3 sigma confidence limit, and less than 36 Earth masses at 1 sigma confidence. It is thought that the object has a mass similar to that of Neptune (~35 Earth masses). Another possibility is that Kepler-22b is an "ocean-like" world. It might also be comparable to the water-rich planet GJ 1214 b although Kepler-22b, unlike GJ 1214 b, is in the habitable zone. If it has an Earth-like composition, the compression of material in the interior of the planet would give an overall mass greater than 40 Earth masses. Such a planet would also produce surface gravity greater than 7 times that on Earth. This is ruled out to at least 1-sigma uncertainty by radial velocity measurements of the system, suggesting Kepler-22b does not have Earth-like composition. 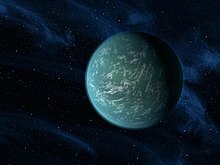 It is likely to have a more volatile-rich composition with a liquid or gaseous outer shell; this would make it similar to Kepler-11f, the smallest known gas planet. The only parameters of the planet's orbit that are currently available are its period, which is about 290 days, and its inclination which is approximately 90°, so that it transits the disk of its star as seen from Earth. No information is available about the shape of the planet's orbit. Many extrasolar planets are known to move in highly elliptical orbits. We only know that the semi-major axis of its orbit is within its host star's habitable zone. If Kepler-22b has a highly elongated orbit it may well only spend a small fraction of its time within this habitable zone, which would cause extreme temperature differences on the planet and make it inhospitable. In order to obtain information about the shape of the planet's orbit, other methods of planetary detection, such as the radial velocity method, need to be used. While such methods have been performed on the planet after its discovery, they have not yet detected what the orbital eccentricity of the planet actually is, and have as of March 2012 only set an upper limit on the mass of the planet. The average distance from Kepler-22b to its host star Kepler-22 is about 15% less than the distance from Earth to the Sun but the luminosity (light output) of Kepler-22 is about 25% less than that of the Sun. This combination of a shorter average distance from the star and a lower stellar luminosity are consistent with a moderate surface temperature at that distance if we assume that the surface is not subject to extreme greenhouse heating. If the planet is found to move in a highly elliptical orbit, its surface temperature will vary from a higher temperature when close to Kepler-22 to lower when further away. If the orbit is indeed highly elliptical, then the temperature variance range will be extreme. In the absence of an atmosphere, the equilibrium temperature would be approximately -11°C. If the atmosphere provides a greenhouse effect similar in magnitude to the one on Earth, the planet would have an average surface temperature of 22 °C (72°F). If the atmosphere provides a greenhouse effect similar in magnitude to the one on Venus, the planet would have an average surface temperature of 460 °C (860°F). ↑ 2.0 2.1 2.2 2.3 2.4 "BBC News - Kepler 22-b: Earth-like planet confirmed". BBC Online. 5 December 2011. Retrieved 6 December 2011. ↑ gives the definition of "Neptunian", among others. ↑ Abel Mendez Torres (2011-12-08). "Updates on Exoplanets during the First Kepler Science Conference". Planetary Habitability Laboratory at UPR Arecibo. ↑ Caleb A. Scharf (2011-12-08). "You Cant Always Tell An Exoplanet By Its Size". Scientific American. ↑ Borenstein, Seth (5 December 2011). "Planet in sweet spot of Goldilocks zone for life". Associated Press. Retrieved 6 December 2011. ↑ Ian O'Neill (2011-12-05). "SETI to Hunt for Aliens on Kepler's Worlds". Discovery News. ↑ Cain, Fraser. "Earth and Venus". Universe Today. Retrieved 28 January 2012. ↑ "NASA, Mars: Facts & Figures". Retrieved 2010-01-28. ↑ Mallama, A.; Wang, D.; Howard, R.A. (2006). "Venus phase function and forward scattering from H2SO4". Icarus 182 (1): 10–22. doi:10.1016/j.icarus.2005.12.014. ↑ "Notes for Planet Kepler-22 b". Extrasolar Planet Database. Retrieved 6 December 2011. ↑ This is technically incorrect, as the term super-Earth applies to any planet with a mass greater than Earth but less than that of a gas giant, without regard to the composition or habitability of the planet. Wikimedia Commons has media related to Kepler-22b. This page was last changed on 26 March 2019, at 17:10.